We ordered the Apple 27" LED Cinema Display the day it appeared on the Apple Store website (Sept 17th). We've had the 27" LED Cinema in our lab since Sept 24th. We haven't done an extensive, scientific comparison with a host of other displays. If you want that kind of analysis, I recommend an article on Anandtech.com. We can share some subjective impressions. The Mini DisplayPort and USB cables are too short (1 meter). If your graphics card doesn't have a Mini DisplayPort, you need a $200 converter box to connect the 27" LED Cinema display. The response time (12ms), though faster than older Cinemas (16ms), is slow compared to many popular third party displays. If you use the FireWire ports on your old Cinema, you can kiss them goodbye. For the 24" LED displays, we obtained a 2 meter Mini DisplayPort extension cable from PowerMax, bringing the total length to 3 meters. We already had a USB cable extension. They also have a MDP/USB combo cable. For the 27" LED Cinema, we ordered two 15 ft (4.6 meter) combo MDP/USB cables from Gefen. This gives us maximum flexibility on the location of the displays in relation to the Mac Pro test units. Apple states that you can daisy chain multiple extension cables up to 19.6 ft (or 6 meters) but we like the single extension solution better -- especially since the MDP and USB cables are fused together. If you have a graphics display adapter with standard DVI ports, to use the 27" LED display, you need a dual-link DVI to Mini DisplayPort converter box like Atlona makes (model AT-DP400). At first I thought, "At $200, you might as well pop for the Radeon HD 5770 at $249." But then we found it for $119 on Amazon.com . Some Mac owners clearly prefer third party displays to those made by Apple. Dell's newest 27" LCD display (model U2711) boasts factory-tuned AdobeRGB and sRGB modes, 6ms response time, and a variety of connections (DVI-D, HDMI, VGA, Component Video, Composite Video, 4 USB, 8-in-1 media slot). But it does lack LED backlighting. Others swear by displays like the EZIO ColorEdge CG303W with wide color gamut, hardware calibration, hood, flexible positioning (landscape + portrait), and dual DVI-D inputs. For bargain seekers, one alternative to the $999 27" LED Cinema is the factory refurbished 24" LED Cinema (12 month warranty) for $599. We decided to replace two of our 23" Cinema displays with two refurbished 24" LED Cinema displays. But when we checked the Special Deals section of the Apple Store, they were out of stock. So we kept checking every day for two weeks and finally they appeared. We ordered them and the next day they were gone again. 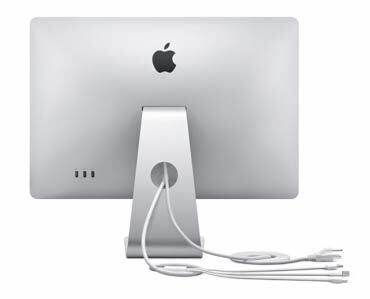 So if you are in the market for a refurbished 24" LED Cinema or refurbished 30" Cinema display, put a bookmark on your Safari Bookmark Bar and keep checking each day. We currently have a 30" Cinema connected to the DVI port on the 6-core Mac Pro with Radeon HD 5870 GPU. The two 27" LED Cinemas connected to the two Mini DisplayPorts. Works like a champ. Apple posted Tech Note HT4279 that seeks to guide you though the multi-display gotchas. Check the Special Deals section for factory refurbished 24" LED Cinema display. Ditto for the 30" Cinema display. They are in and out of stock so keep checking.